The Bengal Natural History Museum is at a distance of around 1 km from the railway station. [Exact location:Below chowrasta on the back side of Gorkha Rangamancha Bhawan or Bhanu Bhawan].It remains open from 9 a.m to 5 p.m on all days except on national holidays. The Museum was built in the year 1903,the idea for starting the Museum was to provide the visitors to have an opportunity to obtain information about the birds and butterflies of the hill areas.At that time there was no intention that the collection should be such which would provide the students to study the fauna of the hills.due to such unsatisfactory reasons new building was formed in 1915.The Bengal Natural History Museum was thus formed in 1923 for the management of the museum. Birds: There are around 822 birds specimens belonging to 405 species and subspecies of the area including two foreign species received as gift. 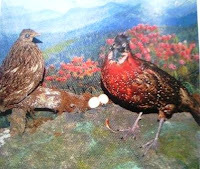 It also contains few collection of birds eggs and its nest though less in number but very attractive and beautiful. Liyod's Botanical Garden locally known as Fulbari was established in the year 1878.Its about 0.5 Km below from Darjeeling Market [or 2.5km from Darjeeling Toy Train Station].The purpose of the garden is to preserve forest species like bamboo, rhododendron ,Orchids,Cactus few medicinal plants and other forest plants. The place is beautifully decorated with beautiful flowers around the area of 40 acres.Visitors are authorized to have look around the place without any restriction except few conditions ,that they should not perform any type of unusual activities such as picking and touching flowers of the garden,smoking inside the gardens. Darjeeling is in the distance of 88 km from New Jalpaiguri or 77 km from Siliguri,There are several ways to reach Darjeeling,one can take local vehicles or buses but one should not miss out the pleasure of the travelling with the steam engine Himalayan Railway ie; Toy Train . The Toy Train is a 60 Cm (24 in) narrow gauge railway which has been declared as World Heritage Site by UNESCO in 1999 for being an example of an innovative transportation system on the social and economic development of a multi-cultural region of the area and it was to considered a model for developments of same transportation system around the world,The Darjeeling Himalayan Railway DHR}is the second one the have the honour.The Toy Train chugs uphill via Tindhar, Kurseong, Sonada, Ghum finally to Darjeeling. Darjeeling is the land of world famous Darjeeling Tea which has been prized above all other black tea,especially in the United Kingdom and other British Empire.There are many tea estates (also called "tea gardens") in Darjeeling, each producing teas with different character in taste . 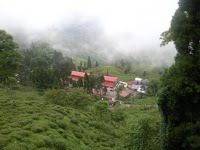 Some of the popular estates include Arya,Happy Valley, Chamong, Glenburn, Lingia, Castleton, Jungpana, Makaibari, Margaret's Hope, Rishihaat-Bloomfield and others like Abmotia, Balasan Arya tea estates.